In just its second outing, the Jota Sport prepared Mazda MX-5 GT finished on the podium after a solid performance in the two and a half hour race at Rockingham on Saturday, driven by Mark Ticehurst and Owen Mildenhall. Qualifying fourth in class the Mazda Financial Services and Motul backed Mazda MX-5 GT steadily reeled in the third place car with race pace proving faster than qualifying. Through the corners the Mazda MX-5 GT was unmatched for grip and handling and with good straight line speed the MX-5 was contesting places with rivals such as Lotus, Porsche and Ferrari. 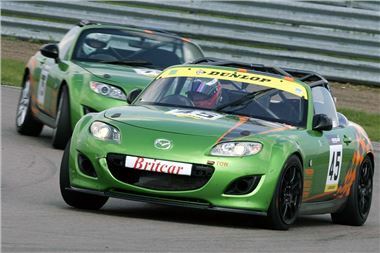 Also entered by Mazda was a standard MX-5 in the production class - driven by Mike Wilds, Former F1 Driver and Mark Hales, freelance journalist - which finished fourth in class. "The team made a number of changes on the car after the race at Silverstone in March to improve its cornering speed. In addition, the changes greatly improved the drivability of the car, as well as dramatically improving handling," commented Graeme Fudge, PR director, Mazda UK. "The Jota Sport team has done an outstanding job getting the car from out of the box to the podium in just two races and with a number of other developments to come for the car we fully expect to be challenging for class wins soon." The next race is at Donington Park on 7 May 2011.